Gerber daisy wedding bouquets are ideal pictures to study before deciding on your bridal bouquet. 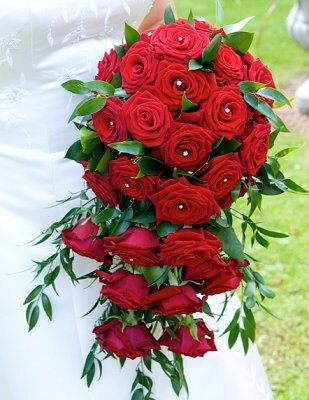 A variety of bold colors, make these flowers a versatile choice for bridal bouquets. You can browse pictures of different Gerber daisy bouquets and hopefully find the perfect one for your wedding. A Gerber daisy wedding bouquet in bold colors is bright and modern. These flowers shout romance when paired with classic flowers like roses and calla lilies, or offer the perfect accompaniment to outdoor, summer, or informal weddings. Pink Gerberas add a pop of color! Combine fresh or silk Gerber daisies with greenery, faux berries, raffia - get creative and your wedding will shine with these flowers! Unique arrangements and colors make Gerber daisies perfectly suited for fall. Keep the Gerber theme going with a grooms' Gerber daisy . Large Gerber daisies make creative seating accents. Gerber daisies are perfect for spring wedding bouquets.